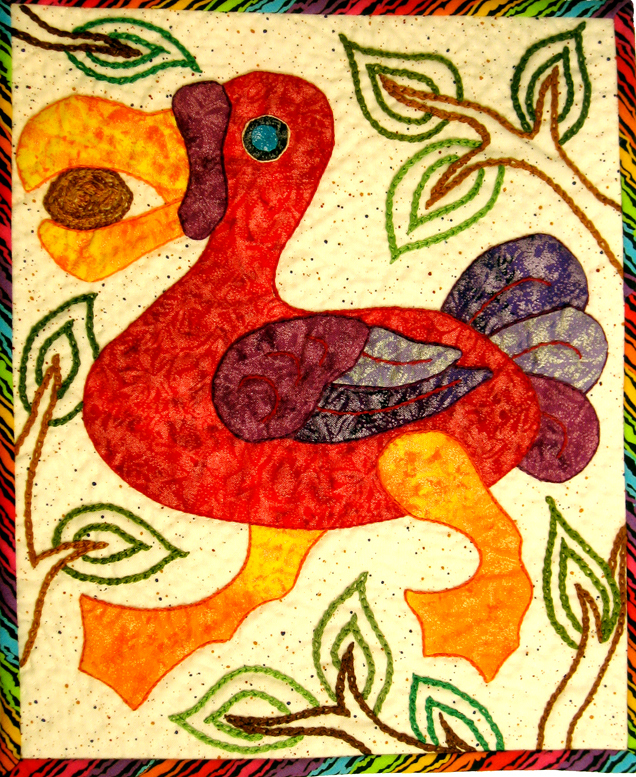 The grand total for the October “Slow & Silent” Auction for the Alzheimer’s Art Quilt Initiative was $2,195. Thanks to everyone who stitched, bid, and helped spread the word. The average bid for a quilt this month was $84.42. The lowest price paid was $40 and the highest price paid was $200. The quilt with the highest number of bids was #2858 (pictured above) with 10 bids. “Alzheimer’s: A Tough Nut To Crack” by Sandy Bartelsmeyer of Carbondale, IL sold for $125. There were 164 attempted bids. In case you’re wondering how the auctions work, here’s the rundown. I select the quilts, picking the ones I think will earn the most money. They have to photograph well, be well-made, have wide appeal and be worth several hours of my time working the auction. Only about 300 quilts are auctioned online each year. The rest go to Houston’s International Quilt Festival where we have a booth and sell them, or to other quilt venues who sell them for us. The auction quilts are moved over to the auction web page, as soon as all the previous auction winners have paid for their quilts. Daphne, a volunteer tells the makers that their quilts will be auctioned. Diane helps me create the behind-the-scenes web page stuff that let’s me do the auction. At the very last minute she puts in the bid buttons. The auction goes live and either Debbie or I start reading the bid emails. We open the bids in chronological order and first check to make sure all the information requested is there. With the exception of the bid name (your special nickname for the auction) if anything else is missing the bid is not accepted and we tell the bidder to try again. We copy and paste the subject line that has the quilt number, the bid amount and the bidder’s name, into a Word document so we can keep track of which quilts get what bids, and which ones advance the auction (move the price of the quilt higher). The subject line is copied temporarily into the web page too so we are sure we are updating the correct quilt, for the right amount, and showing the person’s bidding name who made the last bid. Then we erase it, and save the page. When bids are read and recorded for that session then we update the entire website. We email each bidder at the time we read their bid email to let them know if their bid was accepted, declined, or if they have been outbid by someone else. It is up to them to refresh their browser and check bids for the rest of the auction. At the end of the auction I remove the bid buttons and validate the bids. I print out ALL the bids on paper, so we have a paper trail to prove that the bidding was totally impartial and fair, should anyone need to document this. 9. Then we sort the email bids by quilt in this handy-dandy sorter Debbie and I built out of an old laundry sorter and some file racks from OfficeMax. The emails get tucked into the priority envelopes with the quilts. Little Treasures quilts get an envelope also, even though they are to big to ship in it. 10. 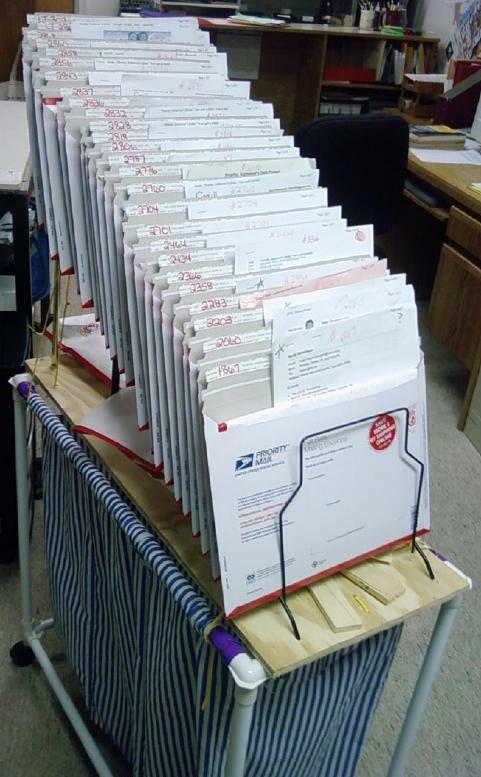 We take the email bids out of the envelopes and arrange them chronologically by date and time on a table. We check them against the Word document, and make sure again that the winning bid has all the information requested. 11. Then I take each winning bid, add insurance, and put the code onto the web page that lets people purchase their quilt online. Those that don’t visit the web page right away get an email reminder. It takes a lot of hours to do an auction but it’s worth it if we can get a few quilts closer to a cure. YOU…and your wonderfully helpful girls…are AMAZING!! Fantastic!! Thanks for all your combined work for this project. I loved some of these qilts but they got a bit too pricey for me. Keep up the good work. Quite the system you’ve developed there… can tell this isn’t your first time around! Love the re-purposed sorter – having it up there saves your collective backs AND allows it to be wheeled wherever needed. (I’m all about making things easier). Collective hugs to all those who make this possible! I thought I new how much time and effort you and your angels put into the auction but your breakdown really tells it like it is. Thank you so much for all the good work. Deb took the words right out of my mouth ——-or out of what little brain I have left.